Bicycles are one of the rare items in our garage that have remained useable and largely unchanged throughout their history. If they are maintained and stored well, many bicycles can even outlive their owners. Chances are that if you take a peek into your garage there is an old bicycle sitting in the corner collecting dust and cobwebs, but with a little hard work and elbow grease you can make the bike brand new again. A fun project for both yourself and the kids, here’s a quick guide to restoring your old bikes into their former glory. 1. Remove the tires and wipe the bike down, cleaning as much gunk off of it as possible. 2. Using a soapy wet rag, wash the pedals, gears, seat and handles to really give it a good clean. 3. 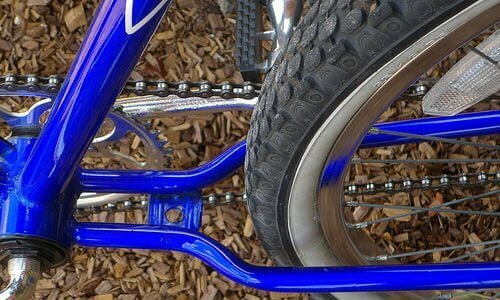 Sand down the frame of the bike to remove unwanted rust and/or blemishes, creating a smooth and clean. 4. Using the pre-taped draping, cover the gear box, chain, pedals, handles, and reflectors. Remember, the most important part of painting is the prep work and if it is done well, painting will be a breeze. 5. Using the spray paint (I recommend kyron blue as it is florescent and easy to spot), holding the can six inches away from the frame. Apply multiple coats as needed keeping in mind that too much paint will make it easier to chip off. 6. While you let the paint dry, apply the bike lubricant to the freshly cleaned chain and gearbox, ensuring a well-running machine. 7. Put the tires back on and go for a ride! While the great spring weather upon us, right now is the perfect time for a fun spring break project that the whole family can get involved with!